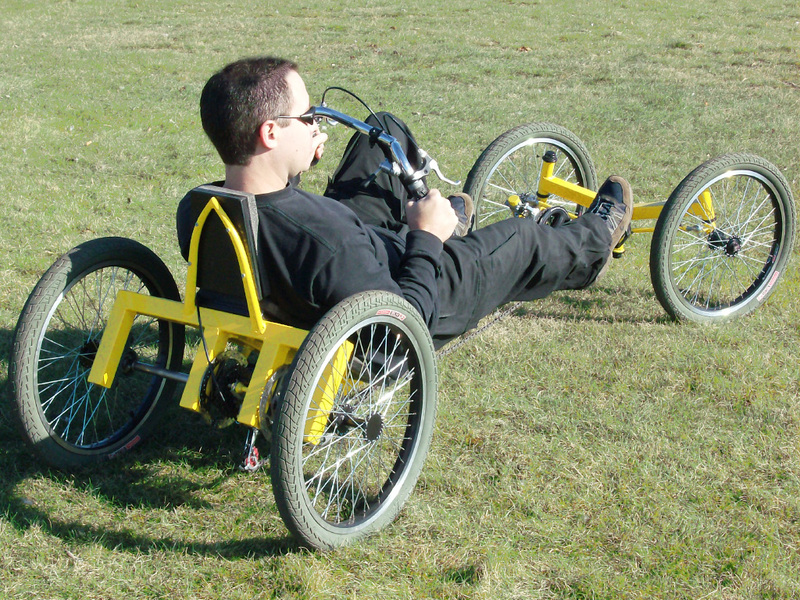 Build Your Own QuadCycle LowRacer. The StreetFighter QuadCycle Lowracer puts the pilot low to the ground between 4 wheels for an exciting ride with amazing traction and cornering ability. Turn the street into your own personal gym, giving your legs the ultimate workout as you push your limits on this fast and nimble human powered racecar. The StreetFighter is comfortable, durable, and great for just about any kind of riding, even off the road on loose gravel since it is immune to tipping. 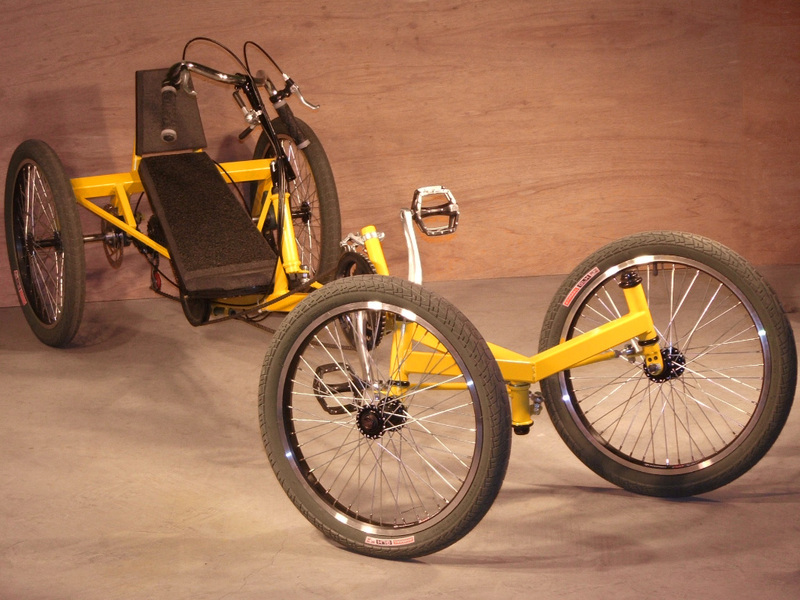 Even though a four wheeled human powered vehicle has more parts than a trike, it is still easy enough to build so that anyone with basic tools ans skills can do it. Every single step of this plan is shown in great detail with clear text and many photos. Almost Every Part is made Using Simple Hand Tools. There are only 2 small machined parts required, and they can be made cheaply by any shop with a basic lathe. A perfect job for a weekend garage hacker with a small lathe. The rest of this DIY QuadCycle can be made using only a hand held drill, angle grinder, and any type of welder. Our plans are even great for first time builders. You are free to make whatever modifications to the plan you may see fit, creating a vehicle of your very own design. The entire frame is made of basic hardware store square steel tubing so that cutting and welding will be easy. The transmission components are also standard parts that can be found at the hardware store or auto parts store. It's Like a Race Car, Your Legs are The Engine. 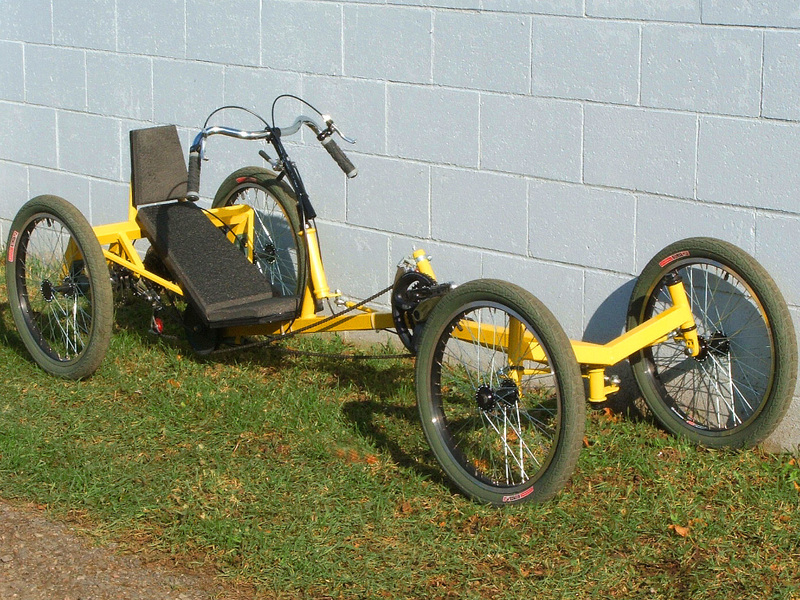 Even though this DIY Human Powered Vehicle is comfortable enough for a long commute, it's almost impossible not to push it as fast as you can. Slung low between the wheels, sitting in the leg press position, the cranks are just waiting to receive everything you can push into them. With 26 or more speeds, the StreetFighter will accelerate like a rocket in low gear, and give you swift speeds in high gear. Hill climbing is also easy on a recumbent. With dual rear disc brakes, your DIY QuadCycle will be able to stop easily, even at the bottom of that massive hill when you reach speeds that exceed the posted city limits! Brakes are independent as well, so you can do some fun drifting and trick riding. Add a Power Assist Motor For The Long Commute. There is plenty of room behind the seat to add some type of gas or electric motor to create a long range commuting velocar. Recumbent seating is also so much more comfortable than upright bike seating. The rear axles and wheels are plenty robust to take the extra loading of a large motor and battery pack, so you can easily experiment with power assist options. Steering is very stable at high or low speeds, so the StreetFighter would make a great base for a motorized velomobile. Proper Ackerman steering geometry ensures stability when hitting corners at full speed or when quickly navigating hazards during those rush hour city commutes. The steering components are easily made, and explained in gread detail in this DIY Plan. Fully Adjustable Cranks For All Sizes of Riders. The sliding bottom bracket allows you to position the cranks anyplace on the main boom by simply adjusting a set of bolts. This easy adjustability means that riders of any leg length can adjust the cranks for optimal power delivery in just a few minutes using only a wrench. 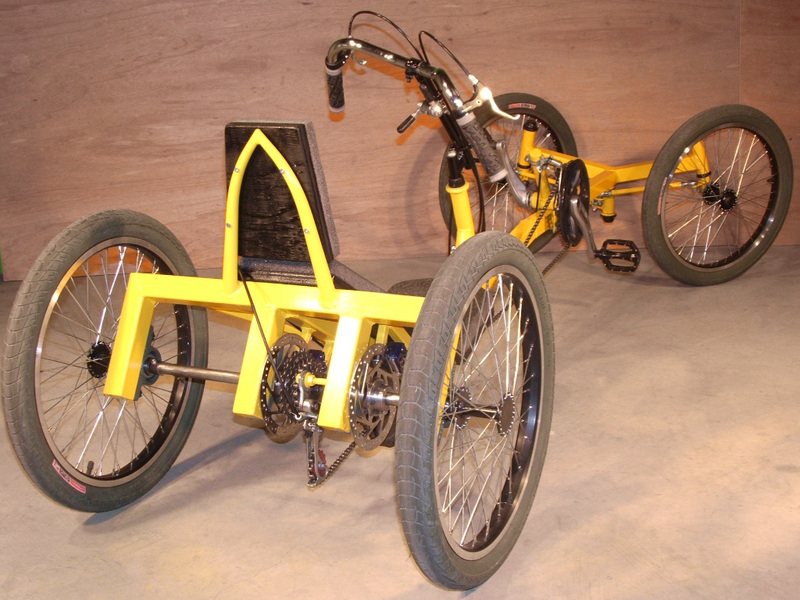 The StreetFighter CycleCar can also support riders of any weight, as it uses extremely durable 36 or 48 spoke 20 inch BMX rims, making it almost indestructable. Most of the steering components can be salvaged from old bicycles, and there are no machined parts required. The steering is easy to align, and offers very predictable and responsive control, even when pushing downhill at highway speeds. Make a DIY VeloCar With A Full or Partial Fairing. 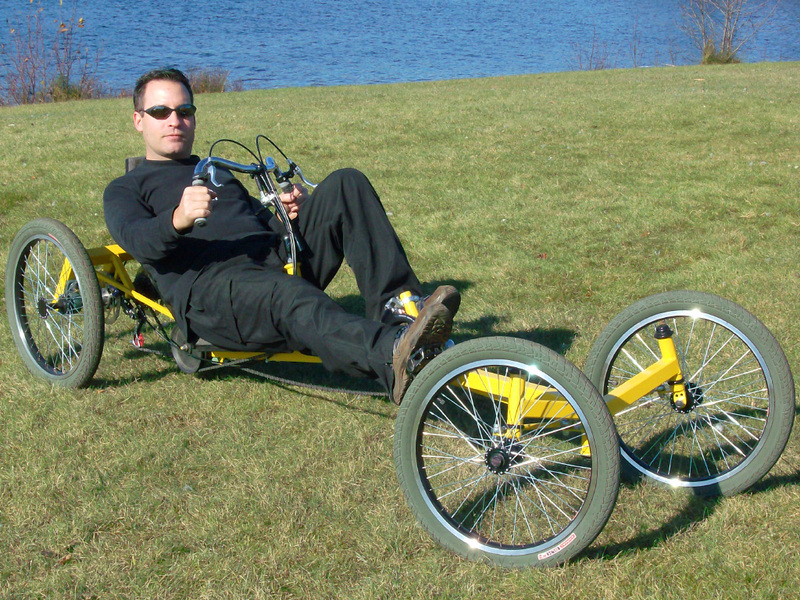 This DIY QuadCycle is a great base for a full or partial body, turning it into an all weather human powered velocar. Using fiberglass, wood, or even aluminum sheeting, you could create just about any kind of body for your velocar, making it a great all year replacement for your car. Because you can easily modify this DIY Plan, just about any kind of vehicle could be made, even a human powered pickup truck with a large rear cargo carrying box or detachable trailer. 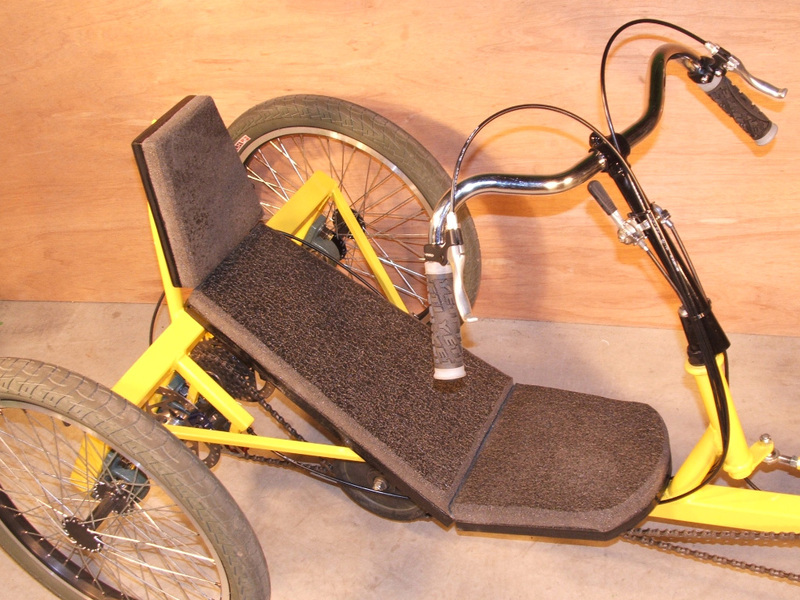 Our DIY Bike and Trike Plans are laid out in a step by step format that allows for easy modifications and utilization of parts you may already have in your junk pile. Build using scrap bike parts, or purhcase everything new from your local bicycle store. 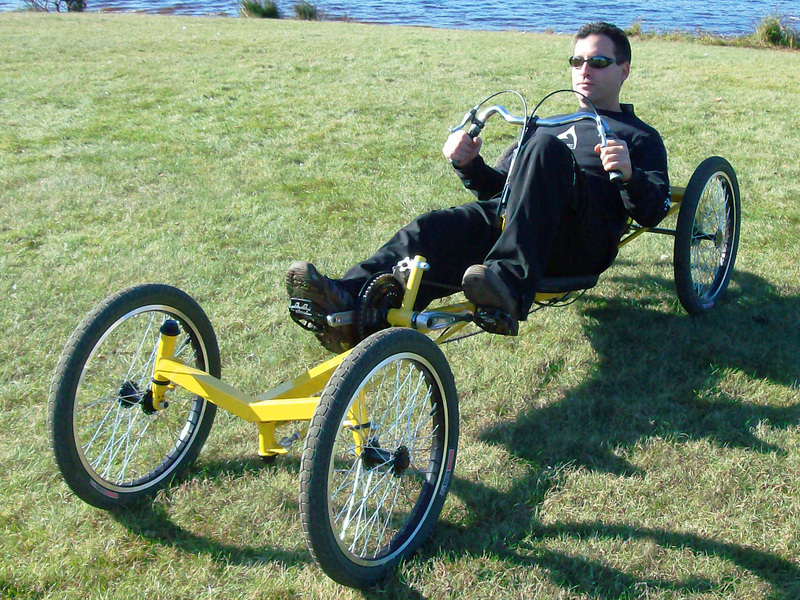 Recumbent Bikes and Trikes Are a Lot More Comfortable. With its laid back seat, and ergonomically placed handlebars, the StreetFighter QuadCycle is great for long range commuting as well as high intensity sprinting. All of your controls such as gear shifters and brake levers are within reach, so you can stay focused on passing your riding buddies, or showing off around the corners. Recumbent seating is more like relaxing in your favorite lounger, so you can ride all day without the usual bike seat pains. With a little patience, even a beginner welder can create a cool DIY QuadCycle from scratch, and it can be done on a decent budget. You can easily alter the design to suit your needs, changing it into a completely different looking vehicle. Zero Fuel Cost, and Weighs Less Than Your Spare Tire! Next time the gas pump rolls into the 3 digits, just consider what you could have built with that kind of cash! How about the cost of your gym membership? With a human powered car, you can enjoy the outdoors and get a great workout while you commute, so it saves you both time and money. Nothing beats the satisfaction of riding something you built yourself, so start digging out those old bike parts, and get building your own DIY QuadCycle. 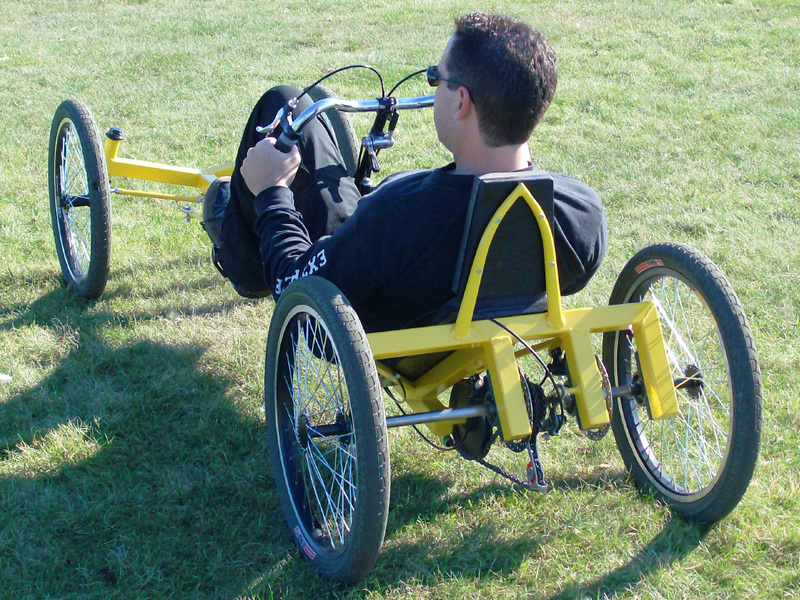 The StreetFighter DIY QuadCycle is a great project for commuting, racing, exercise, or as a base for creating a full body VeloCar. There is a lot of room to easily modify this plan, and like all of our DIY human powered vehicle plans... no experience is necessary.